A big congratulations to all who got into the first ever Garden Trampoline Games for Australia and New Zealand. Quite an honor for all of you and even if you are unable to attend the games for whatever reason just know that you are in the top 50 of all age groups in both Australia and New Zealand. Feel proud and know you will be thought of in your absence over the weekend. To those of you who were successful in getting in and now can attend, congratulations and well done. You are fortunate by having supportive parents and the event on at a time that is manageable for your family in the considerations of both time and budget. We are excited to be a trampoline sponsor of the event, supplying GeeTramp Force trampolines in a couple of sizes. We are looking forward to meeting you all and catching up with others again after past events. This is a list of all who were successful in getting into the games. If you know them via Instagram give them a message of congratulations and wish them well for the event. Which is going to be happening very soon. Register Now -Event Details from Greg Roe Trampoline Website. If your name is listed above and you are able to attend the event you must register with the link below on the official GTGames Website to register by Jan. 10, 2019. Once you have completed the registration process an email package of information will be sent out. The Skybound GTGames Is offering VIP tickets to any gtrampers who are able to attend for a meetup on Friday night with the competitors. the VIP ticket includes spectating of the competition on Saturday VIP SPECTATOR TICKETS are limited and are now available for purchase on the meetup page here. Day, Date and Time Friday Jan. 25, 3:00 p.m. – Saturday Jan. 26, 9:00 p.m. 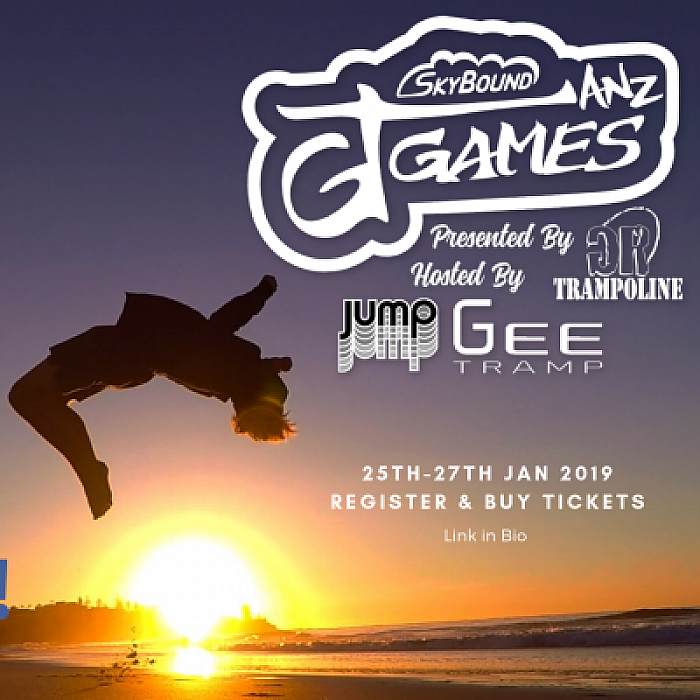 The Skybound GTGamesANZ presented by GRT, in association with GeeTramp, Gravitated Equations and Jump NZ will debut January 26 in Takapuna (Auckland) New Zealand. By purchasing your VIP ticket here you will be allowed to attend and bounce with the competitors after signing a release and liability waiver with a parent or guardian at the event; along with the chance to watch the GTGames on Saturday, attend the BBQ Dinner and receive a Grav GTGames T-shirt. 17:30 - 18:00 DINNER BREAK - B.B.Q. 18:00 - 18:30 AWARDS CELEBRATION !! Tickets Price Qty Total GTGamesANZ VIP Spectator $70 Purchase your weekend pass to spectate the GTGames and receive a GTGamesANZ official T-shirt, supplied by Gravitated Equations, #GRTCrew wristband, Friday afternoon meet-up bounce session with the athletes and a meal ticket for lunch on Saturday! First Ever Female Gtramp Athlete in GTGames in the World.